Latest GFS and NAM suites pulling back on moisture content. See what the Euro does today. From what I have read. Seems the H5 looks great on the GFS but for some reason it went backwards in precip which makes no sense. 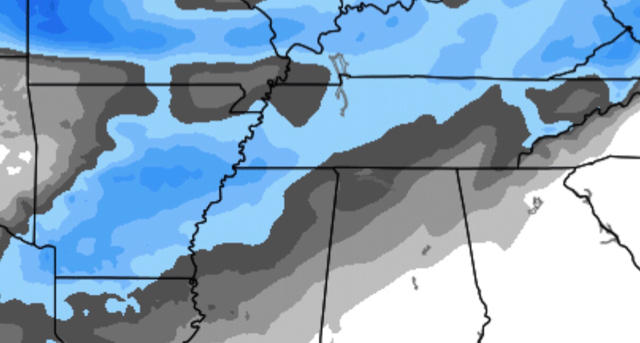 Euro looks like 2-3" here in Memphis. Little early to speculate but possible Winter weather advisory locally. Winter Storm Bugalou was a success for some. As we move to the letter C Winter Storm Curt it is. Strange scenario in that just slightly more than a like 0.15" swing in QPF could mean the difference between not even an advisory-level event to a WSW verification. If we make it to Mempho- wow, what a winter! Bufkit data last night showed ratios starting around 12:1 end at 20:1 ish........ So 15:1 may be middle ground. At least to come up with a forecast. Hard to really argue with that logic. Some models had a small amount of liquid QPF to start- is that still the case? Most have it strengthing right as it reaches TN, then once past ,starts to weaken again. Taking blend we have around .10"QPF to work with, that could be a inch or two. More QPF as you move SW it seems... Still a lot of time to see how this taps moisture. Maybe, we'll get something memorable from this one as well. Just for reference, here's the WSW threshold for pure snowfall in MEG's CWA. Has MEG ever had to issue a WSW for two different storms three days apart? OHX says after a brief warmup by Fri.and next wk end, more artic air is coming. NOA/AO is going negative late month. Plenty if winter left after that they said.